Twenty years after it first rose to popularity in the United States—before quickly declining—the brew-on-premises concept is enjoying a renaissance. Consider it homebrewing without the home, personal equipment and risk of an off batch. Brew-on-premises (BOP) is not a new idea. Hundreds of these small, brew-it-yourself operations popped up during the early 1990s in Canada due to high taxes on store-bought beer. The beer produced at BOP locations was exempt from such taxes, but that’s not the only reason they proliferated up north. These businesses provided a good foundation to would-be homebrewers, allowing them to brew a batch despite lacking the knowledge of the process or not having sometimes-expensive equipment. And to top it all off, they didn’t even have to clean up afterward. The concept soon migrated to the United States. There were only eight such operations in the nation in 1995. That number ballooned to 55 in 1997, according to a Popular Science article published that year. So burgeoning a business was it that for a time Diana Shellenberger was writing a column about BOPs for every issue of The New Brewer magazine, where she served as associate editor. She later wrote Brew-on-Premise: How to Join the Brewing Revolution, a book published by Brewers Publications in 1997. These businesses continued to grow in the years before the turn of the century, though many—just like their bigger brethren—shut their doors as the brewery bubble burst around the year 2000. And now, 20 years after they came on the scene, they’re coming back. While many focus exclusively on the traditional brew-on-premises model, others are complementing that concept with homebrew shops, retail bottle sales, artisanal food offerings, production breweries and full taprooms. Little Mountain Brewing, for example, opened in Kirtland, Ohio, in 2010, but moved to Mentor in 2013 and added a three-barrel brewhouse on which to brew its own beers. Likewise, North High Brewing in Columbus, Ohio, opened its brew-on-premises in 2011, yet recently installed a 20-barrel brewery to keep up with its taproom and other accounts. Eudora Brewing Co. opened in Dayton, Ohio, in 2013 with a small taproom to complement its own brew-on-premises as well, and just last year Diving Dog Brewhouse opened in Oakland, California, with a brew-on-premises and 30 taps in a sharp, modern barroom. This year, Upstate Craft Beer Co. plans to open a brew-on-premises in Greenville, South Carolina, that will offer 20 taps and a tapas-style menu. While this approach is gaining in popularity today, it wasn’t completely absent from that first wave of brew-on-premises businesses. 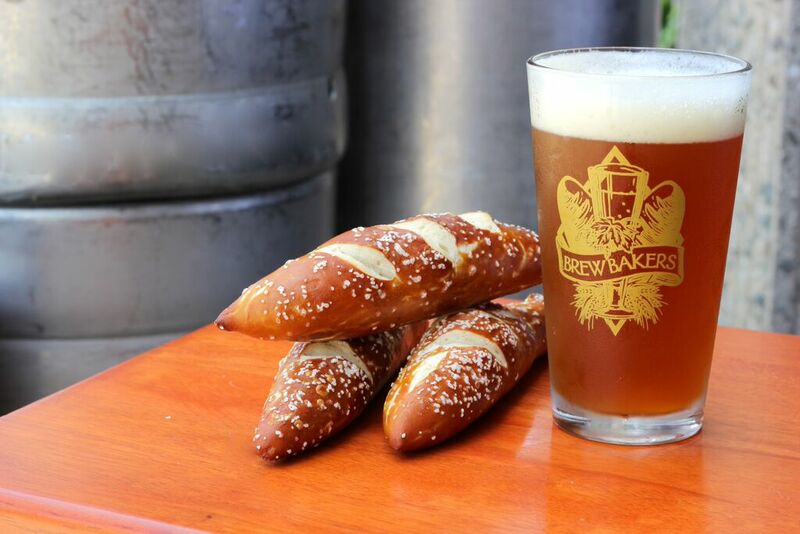 Dennis Midden opened BrewBakers in Huntington Beach, California, in 1996, and he distinguished his business from others at the time by also allowing visitors to bake bread and brew their own sodas. Midden recently sold the business. The new owners remodeled, but wisely retained those same services that have made them a popular destination for almost two decades—and not just among budding brewers, but entire families as well. 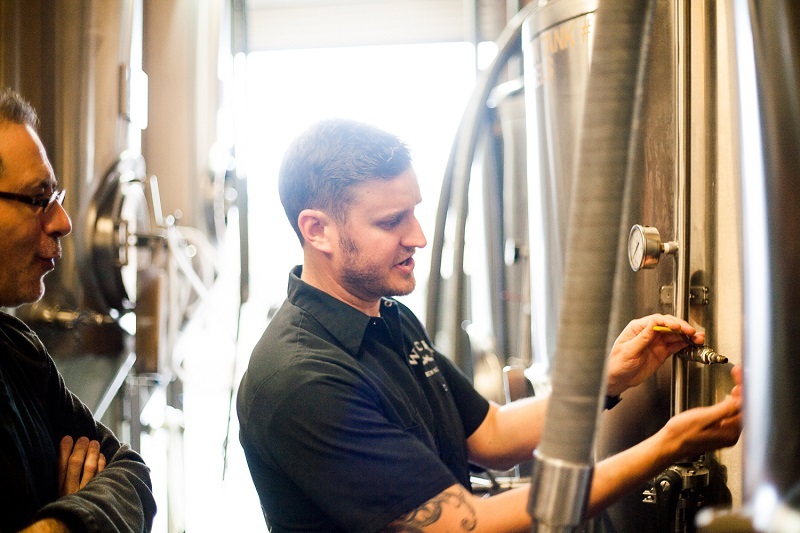 Ryan Wicks is just one of the many who kicked off their homebrewing habits at BrewBakers. It was an experience that led him to open Wicks Brewing in Riverside, California, in 2013. Because the six-kettle stations so common in brew-on-premises operations are no longer in production, Wicks spent six months just trying to track those down. Initially he planned only to offer basic brew-on-premises services. Then two things happened: The space beside his became available, and someone nearby was selling a seven-barrel brewhouse. “We figured we’ve got the space to do it; we might as well add the bigger brewery,” Wicks says. Step into Wicks Brewing today and it’s hard to believe that the business was originally planned as only a brew-on-premises. There’s a dining area that seats more than 200 people, and to the left of this area is a half wall separating the brew-on-premises system. Past the dining area are the brewery’s taps, and behind those is the much larger seven-barrel brewery. Thanks to the larger brewery, Wicks Brewing can brew enough to supply not only its own taproom, but other beer bars as well. While it currently only distributes kegs, it plans to bottle in the near future. Several other brew-on-premises outfits have made similar leaps. Founded by Lee and Karen Cooper, Hopsters in Newton, Massachusetts, opened in September of 2013 as a brew-on-premises and restaurant. After seeing how popular their house beers were on draft, the Coopers decided to bottle their Imperialist IPA, Market Square Tripel and Endless Vacation (a table beer). Though you can now find these bottles in select locations, many still head to the source—and it’s easy to see why. A plush couch and several rich, wooden tables sit atop hardwood floors that stretch from the front door to the bar, where Hopsters pours a mix of guest and house beers from 20 taps and two cask engines (Lee Cooper lived in England before coming to the United States, and has a fondness for real ale). Mere feet away from the bar is the pièce de résistance, a custom setup of two brew stations composed of five kettles each. 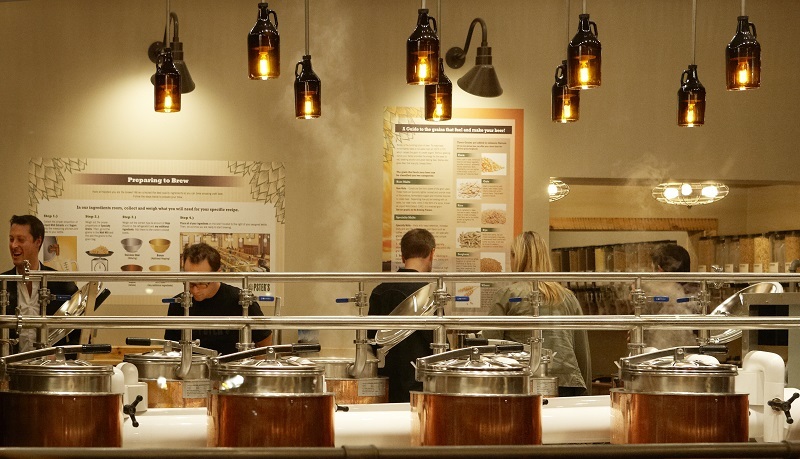 Here, visitors brew their choice of 30 recipes. When they’re done, they can reward their hard work with a variety of flatbreads or cheese and charcuterie boards. All of this— the brew-on-premises, the taps, the locally sourced foods— combines to create a unique encounter for Hopsters guests. And this is true of so many of the new breed of brew-on-premises businesses. They offer something that wasn’t here before, something missing during that first wave of brew on-premises breweries. For as popular as they were in the 1990s, most followed the same basic model. Is the nation ready for this second revolution? How can you mention BOPs in Ohio without mentioning The Brew Kettle? I came across them in my research, and while they’re obviously a pioneer when it comes to brew-on-premises operations I wanted to focus primarily on the new wave of these operations (BrewBakers notwithstanding). I appreciate you reading. Would like more info close my area .(85137) . Tried this in early 90’s it was great ! Thanks for the mention. Chat soon. Jack @ Upstate Craft Beer Co.
We are located in Cambridge, Maryland. Where would our best bet be for a Brew on Premisis location? Thanks for the great article! We opened a BOP, HiFi Homebrew and BBQ Supply, in Clearwater, FL in late February. It’s nice to see BOPs making a comeback and the new wave taking place. In addition to BOP we have a full service homebrew store, BBQ products, and classes on brewing and BBQ/Grilling. Soon we hope to offer even more. I am interested in starting a Brewer’s Club in CT. I was thankful for this great article. Can you suggest anything to me as far as ideas and further reading? I know of one Brewer’s Club in Chicago, do you know of any others? I picture the cub as a member run BOP witch is set up as a non profit, what do you think? I am interested in starting Brew-on-premises (BOP). where can i go and get more information about. I try to find the book online not able to find it. I’ve got brew on premise equipment bought in Canada stored in Idaho possibly for sale. Send email [email protected] if interested.